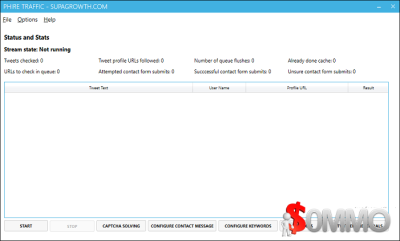 Contact Form Submitter is a software tool that allows users to generate traffic by automatically submitting a websites contact form with any given message and contact details. T his is one of the most powerful tools available for automatic contact form submission. Enter the required details such as your message, email, telephone number and website then click start and let this contact form bot do all the hard work for you. 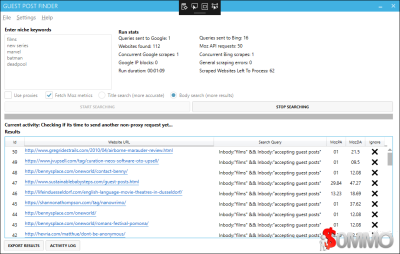 Guest Post Finder is a 100% free and full desktop application that will search (scrape) Google for guest posting opportunities in your niche so you don't have to spend hours manually doing the same. It will even check Moz DA for each website so you can assess how powerful each link will be. WordPhire is an experiment I've written to see if we can automatically add comments to wordpress websites that actually add value to the website and will genuinely help out the website owner. TrafficPhire allows you to automate a large part of your outreach. If you want to promote your website or new content to other webmasters/businsess it can be very time consuming filling out contact forms. TrafficPhire listens for users on twitter (based on what they tweet) and fills out their website contact form with your custom message if its thinks they'll be interested in your product or service. As SEO is shifting more towards content marketing than just manually building links having the ability to automatically market your content with laser targeted precision while on autopilot can change your business. TrafficPhire uses the Twitter API to for people in your niche then populates and submits thir websites contact form. Harvest fresh and relevant backlinks, Collect high-quality keyword backlinks,Search, save, comment, and rank! BacklinkRefresh is a powerful tool for automatically collecting fresh and relevant high-quality backlinks for your web site. BacklinkRefresh is very easy to use. Simply enter your target keyword and choose your options for backlinks from .COM, .NET, .ORG, .EDU, and .GOV web sites. Save the search results, visit the sites, and leave a comment. This simple process can help gradually increase your backlinks and ranking over time! Backlinks generated with BacklinkRefresh come from recent, well-maintained blogs. Results can come from blog posts as recent as 1 hour old or span across the entire year. These types of fresh posts are often well-moderated, contain few existing comments, and result in quicker comment approval and backlink generation. GuestPosterPRO lets you find high traffic sites in any niche that accept guest posts quickly and easily. It's Simple, Fast and Effective. Guest Poster PRO is the amazing software lets you find high traffic sites in any niche that accept guest post quickly and easily.. We know that you will be extremely happy with your purchase, but want you to have full peace of mind. Therefore, we offer a complete 30 day money back guarantee with no questions asked. Get Guest Poster PRO now! Can Traffic Aid REALLY Help You Build A Steady Steam Of 'Google Traffic' By Using Their 'Secret' White-Hat System? Is TrafficAid Truly a Fast Profit-Generating System? This is the power of commenting, but there is one problem: it takes a lot of time to find blogs, and you may never find some with the most social power. That’s where TrafficAid Software comes in handy. Relevancy and quality are probably the two most important words in today’s SEO world. The best type of backlinks is the one coming from relevant, similar websites to yours, which are in the same niche or closely related niches. That’s what’s so beautiful about guest posts. The simplicity of the system allows you to get the most relevant type of backlink possible WHILE still getting direct traffic from the guest post itself. There’s no doubt that guest posts work and they work incredibly well (we have tons of proof for that) but it’s really hard to identify guest posts that are worthy of your efforts, with so many outdated low quality blogs out there. GuestPost Supremacy will change that. This amazing little software harvests hundreds of guest post opportunities within minutes, for any keyword you can think of. Not only it does that, you can also see the Page Rank and Alexa Rank right within the app. You can even save the URLs that you like and email the webmasters straight from the software. Guest Post Hunter is the Free Tool Which Helps You To Find Those Blog Which Are Accepting Blogs Post. You Can Search Blogs & Send Direct Emails From This Software. its amazing software for Backlinks. ask for guest posting to other webmasters and increase Backlinks for your site.